When we first arrived in Bahrain, before all our stuff arrived, I asked my then-four-year-old what she’d like made out of the boxes. In Jordan, she asked for a library (with loaner kittens and a Jacuzzi). Amazingly, our library made out of two large moving boxes, lots of duck tape and some paint, lasted over two years! So I wasn’t sure what to expect this time. When she asked for a gas station I can honestly say I never would have guessed that. So, my first project was to make a gas station for our three Cozy Coupes (yup, three of those suckers). Thanks to the gods of Pinterest, I whipped one up pretty quickly. A bit bare bones, but it functioned as required. Next was a kitchen. My first cardboard kitchen in Jordan I went all out with design, paper maché, recycled plastic knob caps, paint, etc. The knob caps lasted about 2 days before being pulled off. But everything else lasted almost three years. I did that in the pre-babies nesting craze and everyone enjoyed it for the years to come. This time around, I had three little ones vying for space, so I re-designed it to make it larger, modular and with more surface area. I also made the design and decorations a lot more simple. No paint, no shelves, no paper maché this time. Just white duck tape to cover things up, a thick black marker, an exacto knife, and a piece of fabric. Initially I did try to make my own faucets out of plastic bottles for the sink (which was a plastic basin just resting in the hole), but those were quickly ripped off. So I opted to buy a Little Tykes toy sink (which fit in the hole perfectly) and a bag of stove knobs that I jury-rigged using bolts and large washers so they could actually be spun. I thought about having an oven that opened, but decided against it, drew it on and just went with the under-the-sink area. 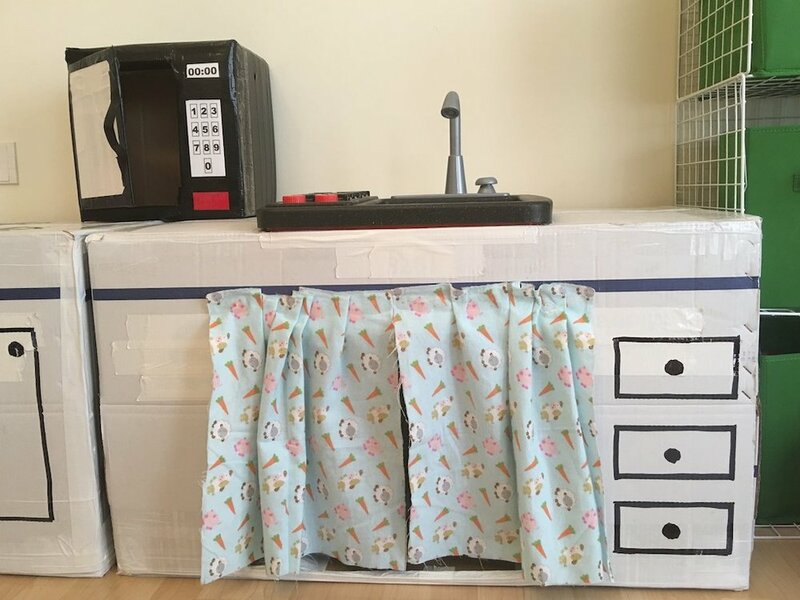 For added insanity, I also made a microwave and a fridge. I had this vision of all the play food being neatly stacked in the fridge. Silly, Mommy. I think the empty fridge will be re-purposed soon. To follow on from the "library" in Jordan, I thought maybe we’d try a castle this time. The issue I found was that the moving boxes we now had in Bahrain, were not the same type we had in Jordan. They were smaller and less sturdy. Which meant I needed to be a little more creative. I managed to do three castle parts that I then attempted to tape and glue together. I did some simple cut-out windows, some battlements, a glued-on red velvet “door” and some simple sponge-painted bricks for effect. The kids enjoyed it (so did the cats), but because it wasn’t as sturdy as our library, and after a few run-ins with bigger kids who liked to climb out the window, we saw it collapsing into ruins after about 9 months. Recently one night, seeing parts lying flat on the ground, I dragged the pieces out to the trash and bid farewell. Okay… so next project? Well, we were coming up on a double three-year-old birthdays, so I started poking about on the devil’s playground, also known as Pinterest. And I found it! TeePees!! I spent a few days looking at pictures and mentally designing it in my head. Then I had it. So after school drop-off one morning, I drove over to my pvc-guy. That’s normal, right? I wandered into the small sanitary-ware shop and found the same guy who helped me last time. I told him I wanted more pvc (I’m still finishing up the first project: cat beds). So I followed him back outside into the 108+ temps, and we walked down the side alley. Back in the US, I probably would not have felt comfortable following a man into a dusty side alley, but I’ve lived in the Middle East long enough to know that all good things are in back dusty alleys. Same was true here; the pvc stash. All the pipes were 3 meters long (almost 10 feet). He got one out for me but I felt it might be too thin and wobbly, so I asked for a thicker one. This was perfect! I asked how much it was. Wiping off the thick brown layer of dust so he could see the numbers, he made a quick phone call and then told me it was 900 fils (about $2.30). I told him I’d like four. So he pulled them out, and then taking a filthy rag, kindly dusted them off (sort of). He tied them together with thin wire and then carried them to my car. So for less than $10 I had my teepee frame! With some help and a step-ladder, and far too much input from an obnoxious Bahraini kitten, I managed to get the basic frame put up using large zip-ties. Then I had to find a covering. I first tried an old queen-sized sheet, but it just wasn’t big enough. So either I was going to have to do some cutting and sewing, or I needed to find another solution. The solution came in a queen-sized comforter cover we didn’t use anymore. I sliced it open down two sides and essentially just wrapped it around. It’s far from perfect, with yards of fabric pooling on one side, and a split zipper on two sides. But I did sew up the two “door” sides to make them less tatty. I then used scissors to cut little holes on either side of the poles and tied ribbons around them to secure the sheet in place. I also threaded ribbon through the top of the doorway to close it a bit. With the old comforter in place as bedding, and some fairy lights that I had a local electrician add a toggle switch to, we were all set! It’s not nearly as Pinterest-picture-perfect as I would have liked, but considering my time and brain constraints, I’m happy with it. And even better, the kiddos like it, too. And who knows, I just might opt to curl up in there with a book and a cup of tea one morning while the munchkins are at school; providing I can nudge over one of the cats, that is.